Meadow Lakes, Alaska Real Estate Explore Homes for Sale in Meadow Lakes, AK! Meadow Lake, Alaska, has a picturesque landscape. There are mountain views. Animals, such as elk, can be seen running about. It has a pristine atmosphere. It is a place that makes a perfect hometown. If you love nature, you will love Meadow Lakes. Anchorage is 28 miles away. Meadow Lakes is part of the metropolitan area of Anchorage. It is conveniently located within a few miles of several cities. There is easy access to all amenities. At the same time, Meadow Lake offers a respite from the hustle-bustle of everyday life. It could be called the best of both worlds. In 2010 Meadow Lake’s population was 7,570. It has grown by 57% since the year 2000. It continues to increase in population. The average age of its citizens is 35. The average income for a family living in Meadow Lake is $59,000. Homes vary in price as in other cities. A good median value of a home in Meadow Lakes is around $190,000. A person can expect to pay around $800 to rent. Property taxes are relatively low making Meadow Lake quite attractive. Unemployment in Meadow Lakes in 2012 was 6.5%. This is lower than the national average. Several universities are located within 200 miles. This affords one the opportunity to finish their education or to train for a new career. Several industries offer employment. Construction is the largest industry. Transportation and warehousing come in second. There is also mining and oil and gas work. Technical and scientific services are also needed. Administration and educational positions are also available. The summers in Meadow Lake are cool. The temperatures stays in the 50’s most of the time. July is the warmest month. July’s highest temperatures can reach to almost 70 degrees. Summer temperatures vary greatly between the days and nights. They can vary as much as 20 degrees. January is the coldest month of the year. The minimum temperature can dip to almost 7 degrees. Temperatures during winter can also vary up to 20 degrees. Meadow Lake receives almost 17 inches of rain a year. September receives the most rain with about 3 inches. There is skating, miniature golf and movies to entertain your family. There is also hiking, canoeing, fishing and camping within driving distance. In the winter skiing, dog mushing and snow machining are available. Several state parks and recreation areas are a short distance from Meadow Lake. The Chugach State Park and the Independence Mine State Historical Park are two that offer many recreational opportunities. The Nancy Lake State Recreation Area and the Summit Lake Recreation Park also offer many trail, camping grounds and clear, crystal lakes for your enjoyment. 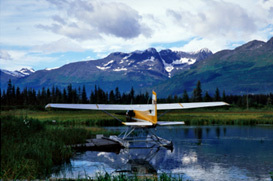 If you enjoy nature and its beauty, you will love Meadow Lakes, Alaska. It is a growing city. Maybe you will be one of the next to call Meadow Lake your home.